On Saturday, March 30th, the Business Technology Management program’s Case@BTM hosted the annual Case Debug competition. The competition addresses a case at the intersection of business and technology – this year looking at the BMW Mini in the face of both political pressures associated with Brexit and preference for electric vehicles, in alignment with BMW’s 2020 goals. “The competition was done really well. In conversation with the judges we were really impressed with the presentations, depth of analysis, and communication." Presenting teams were divided into one of three semi-finalist groups and given 15 minutes for their presentations followed by 10 minutes of questions and answers. From each of the presentation rooms, the three first place team were invited to have one group member do a short, 90 second pitch to the judges for their shot at the title spot. Recommendations from the teams included AI implementation to improve supply chain and moving manufacturing to Asia and/or the heart of Europe in order to protect from the uncertainty in the UK around Brexit and to allow better access to countries already equipped to support the supply chain for electric vehicles. “The competition was done really well. In conversation with the judges we were really impressed with the presentations, depth of analysis, and communication. “ Assistant Professor, Kevin McDermott told the teams before the announcement of the winners. Congratulations to Team Alpha for earning first place with their recommendation and presentation! 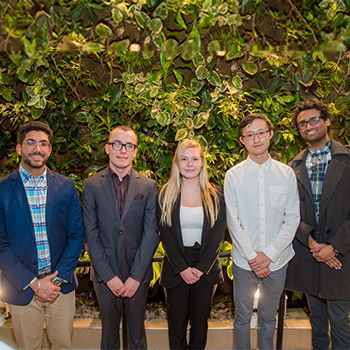 Cassandra Pike, Logan Naudi, Zhenghang(Jason) Xu , Faaiz Rabbani and Daniel Mensour presented a well-thought out plan with confidence and impressed the judges and their peers alike. A special congratulations as well to Team India, the second place team comprised of first year students – Patrick Rocchio, Arjunn Sivakumar, Abhirup Shah, Sebastian Woo and Aly Soliman.